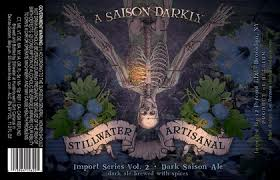 Loosely defined as a decadent noir saison, its musky stout-like dark-roasted chocolate malting and molasses-smoked dried fruiting receive an unusual hop-charred rosehips-hibiscus spicing. Soured fig, purple grape, black cherry, prune, raisin and blueberry tartness scurries above dry licorice snip. Headier than its 8% alcohol volume lets on.